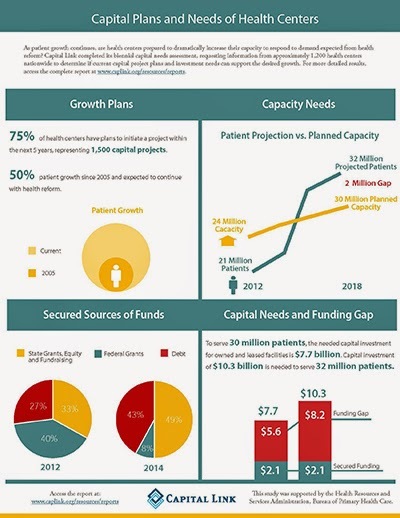 Capital Link announces the release of Capital Plans and Needs of Health Centers: A National Perspective, a biennial study conducted to determine the current capital plans of health centers across the United States and whether those plans, if funded and implemented, would be sufficient to provide the facilities necessary to accommodate patient growth expected as a result of Affordable Care Act implementation. This study was supported by the Health Resources and Services Administration, Bureau of Primary Health Care. The dramatic increase in patient demand over the past several years has necessitated rapid growth in health center facilities. The number of patients served by health centers grew 50% between 2005 and 2012, and this trend will only continue in an era of health reform. Capital Link conducted this study to determine capital project plans, investment needs, sources of capital, projected funding gaps, and growth readiness to expand facilities to meet the projected market need. Data was requested from 1,200 health centers, resulting in a 33% response rate. Three-fourths of the responding health centers indicated that they had specific plans to initiate capital projects within the next five years, which Capital Link estimates will total approximately $5.1 billion for owned facilities and $2.6 billion for leased space. This facilities investment should accommodate an additional 5.9 million patients for a total capacity of 30 million patients and 31,000 providers by 2018. With 32 million patients annually projected, however, a total capital investment of $10.3 billion in physical infrastructure, including leased space of $3.4 billion, will be needed. Funding for health center-owned projects has been identified and secured for only 37% of planned projects, leaving a $3 billion gap to accommodate 30 million patients and at least $4.8 billion to reach the 32 million patient goal. Key findings are illustrated in the following infographic. For detailed results, access the complete report online at http://www.caplink.org/resources/reports. 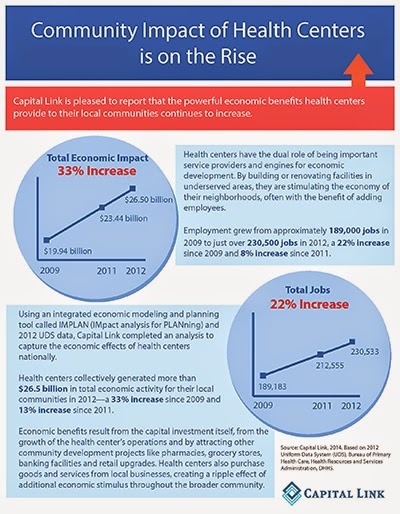 Using an integrated economic modeling and planning tool and the latest Uniform Data System data (2012), Capital Link captured the economic effects of health centers across the nation. Health centers collectively generated more than $26.5 billion in total economic activity for their local communities in 2012 – a 33% increase since 2009 and a 13% increase since 2011. Employment grew from approximately 189,000 jobs in 2009 to just over 230,500 jobs in 2012, a 22% increase since 2009 and an 8% increase since 2011. Download a PDF copy of the infographic here. In the past, health centers have used this information to educate policymakers, seek community support, and pursue funding opportunities. For more information on economic impact analyses, visit our website or contact Steve Rubman, Manager of Data Resources & Analysis, at srubman@caplink.org.